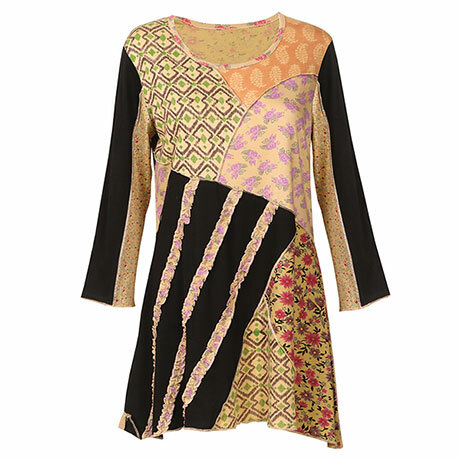 Some clothes are just more fun to wear, like our playfully detailed tunic. Florals and paisleys, patches and ruffles, every-whichway seams, and bands of dramatic black combine in a piece that pairs with jeans or leggings. Scoop neck, 3/4-length sleeves. Size M hangs 31" inches, longer on sides. 100% cotton jersey knit, sizes S(6-8), M(10-12), L(14-16), XL(16-18), 1X(18-20), 2X(20-22), 3X(22-24). Machine wash. Imported.